Instead of taking advantage of the holiday sales, I spent my “Christmas money” on a trip to the cardiologist for a nuclear stress test. As the treadmill speeded up and the incline became steeper, the goal was to see how long it took my heart to reach 129 beats a minutes. It took 9.8 minutes, which statistically speaking, means I have the stats of a 28-year-old female. That’s incredible because statistically women my age—68—reach a heart rate of 129 beats a minute in only 3.2 minutes. While that’s great news, I still don’t know what caused me to almost pass out in Neiman Marcus. The stress test technicians were amazed at my “performance” and wanted to know details about my diet, exercise and my life. Even though I’ve always eaten right and exercised, I didn’t tell them I’d been an adrenaline junkie who sought extreme adventure at every turn with things that should have killed me or, at the very least, taken years off my life. Even in my 50’s, I spent time with Mexican drug lords and a serial killer… none of whom were safely in prison. After I was diagnosed with breast cancer in 2004, my “need for speed” simmered down, and I became even more vigilant about diet and exercise, hoping to lessen my risk of recurrence. My physical needs changed as well. Since then I require seven hours of sleep, and I feel even a single glass of wine I drank the night before. As someone who had the Top Breast Cancer Blog and researched and wrote about women’s health, imagine my surprise when I discovered one of the biggest health risks for women over 50 isn’t breast cancer or heart disease but losing our sense of purpose. If we lose our sense of purpose, it can result in a loss of positivity, our sense of well-being, fewer social relationships and ultimately… poor health. After 50, most of us no longer want to “set the world on fire” like we did when we were younger. For many of us our sense of purpose changes from raising a family or working outside the home to writing, learning a new language, volunteering, even starting a new career. In the Midlife in the United States (MIDUS) Series: A National Longitudinal Study of Health and Well-Being, 10,000 people were followed for 14 years. The results shouldn’t come as a surprise: Those who had a sense of purpose and community had a lowered risk of mortality. Similar studies have shown “purpose” reduces risk of heart failure and Alzheimer’s. Annie and Lulu, 1010ParkPlace, another business I run, church and friends give me a sense of purpose and community. Since my Neiman’s episode, however, every morning I listen to guided imagery affirmations to help with depression and panic attacks. As you think about aging, are there any things you need to work on that would benefit you healthwise? Do you have a sense of purpose and community? Happy New Year, dear friends! I want all of us to stay healthy! I am so happy to hear your heart is healthy. For me I seem to have panic attacks, (much fewer now) when something unexpected brings a flood of memories, or I’m in a sea of unfamiliarity. Happy New Year to you and best wishes for a fabulous, purposeful year. Thank you for sharing your health update with Instagram. I went to your blog for the first time as a result of that post. I want you to know that reading that a woman’s “finding purpose after 50” is will significantly lower her mortality rate stoped me in my tracks. I am more committed than ever to “find my way” now that my main job of raising my family is coming to a close. So glad you are ok, but you can’t mention spending time with Mexican drug lords and a serial killer and not write about that! That’s a smart, well-informed guess, Joycee, but I don’t think it was the cause. Thanks for the suggestion, however. Ha! I love that upon reading this, I can now say I’m fewer than six degrees from Mexican drug lords! What a life you lead. I’m inspired by the health issues you’ve overcome and the habits that keep you healthy. Cheers to improved health for one and all in 2018! Several years ago, Gretchen Rubin blogged about developing a formula for happiness. One of her elements was to be part of something that’s growing. Which I think is is another way of making your really key point: how important it is to have a sense of purpose., to be involved in something–especially as we near or are in our retirement years. I SEE THAT ALL AROUND ME.WOMEN with NO SENSE OF PURPOSE!I even have been known to THINK THAT! They just give up, don’t care how they look or what they EAT! Check this out CAROTID SINUS SENSITIVITY!!! Also, think back on THAT DAY were you HYDRATED? I suffer from this too and they have yet to figure ME OUT! I HAVE MITRAL VALVE PROLASPE as well…………. Have you done a ZIO PATCH?I have only done the HOLTER M……….TOO TOO MANY TIMES and I don’t think they are as good with this as the ZIO PATCH which supposedly doesnot FALL OFF !! I am asking for the ZIO on my next appointment! PS.POP over to my BLOG!YOU will ENJOY my trip SOUTH I THINK!!!!! Contessa, This is the first time I’ve heard of the Zio Patch. Looked it up and I like it already. Will mention it to my doctor. I’ve read half your blog after I received it and then things went crazy around here so thanks for mentioning it. Am on my way to read the rest! Great information! I think that starting my own business 3 years ago added years to my life. I love waking up every single day and haven’t had an issue with my depression in such a long time. I know the fight isn’t over, but I seem to have won the battle at the moment. A sense of purpose… yes! I feel this shift significantly in my life right now. It’s a short step from purpose-driven to losing purpose. Thanks. Hello Dear Elaine! Have I told you I think of you nearly every time I drive down a street near the house where I moved a year ago? There’s a business on that street where I pulled into their parking lot years ago so I could talk to you on my cellphone. You’d been out for a walk… in the rain, and we talked for a long time about the ups and downs of breast cancer and treatment. Funny how the most unlikely “place” can still be connected to memory. Your comment that it’s a short step from purpose-driven to losing purpose is so profound. It’s a good description of how quickly we can lose focus and become ruderless. It can happen just when we think our lives are on a good track but the realization it’s already taken place often takes a while to catch up with us… like the sound being out of sync with the video. We keep on moving until we discover our story has a different ending. Being a woman of that “certain age” …. or at least I think I am; finding a purpose for me has been an unexpected journey. I retired last March after working 50+ years, I was thinking I’d be doing some traveling, volunteering with animal foundations and volunteering with the USO, I instead have found myself working virtually full time again and enjoying EVERY moment. I love having the purpose at this time of working because it’s a choice, not a necessity. My ability to still provide in a work environment is lovely! Amazing results from your heart test. What is your exercise regime? Have you shared tips along the lines of fitness and healthy eating in other posts? I would be interested in reading more. Hi Pat, I haven’t shared my exercise regimen because I figure everyone already knows what they SHOULD DO. Part of why I have good heart health–except for the damage chemotherapy did–is because I’ve worked out three times a week since I was in my 20’s. Yoga, water aerobics, free weights, weight machines, elliptical machine, treadmill… Then there’s diet… My father was a diabetic so I never developed a taste for sweets because we didn’t have them in the house. I eat foods as close to what God made… fresh fruits and veggies, grilled chicken, almond milk/fruit smoothies, almond butter. Rarely do I have fast food. My cardiologist called the other night to discuss my test results. He confirmed it was decades of exercise and healthy eating. LOL! He said if more people lived like I did, he’d be out of business. One of my girlfriends was shocked when I was diagnosed with breast cancer in 2004 because as she said, I was “the poster girl” for living right. 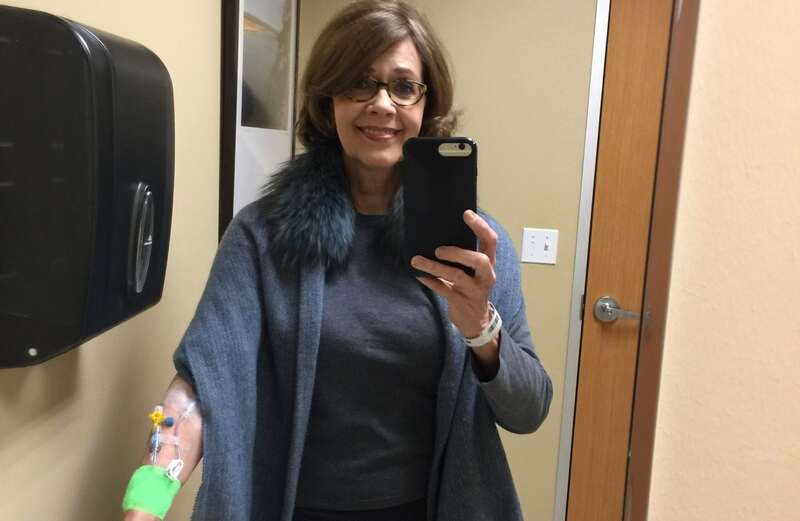 If I GOT BREAST CANCER, “there’s no hope for the rest of us.” Unfortunately that girlfriend was diagnosed with breast cancer 8 years after I was. She’s good now but didn’t use that as an opportunity to change her habits… I worry about her. Thanks, Pat.